UPDATE Sept. 22, 2015: Judge overturns ban on polystyrene foam in New York City. See Plastics News story. As of July 1, New York City has become the largest city in America to prohibit the sale, possession and distribution of items made with single-use expanded polystyrene foam (EPS), a petroleum-based thermoplastic. According to the NYC Department of Sanitation, the ban includes single-service cups, bowls, plates, takeout containers, and trays, and polystyrene loose-fill packaging (packing peanuts), those pesky little things that cling to your sweater after you unpack your new wine glasses the UPS guy brought you. EPS is 95 percent air. Because it's so lightweight, it takes up less than 1 percent of the total municipal solid waste stream by weight, but its volume is much greater. So landfills are teeming with items made from the stuff, and it doesn't biodegrade, despite foam industry claims to the contrary. And there are many issues with recycling EPS, involving energy usage, toxins, and lack of recycling programs for #6 foam, which is polystyrene. The provision is bold action for Mayor Bill de Blasio, who said in a statement, “These products cause real environmental harm and have no place in New York City.” The mayor is urging alternative packaging options, but small businesses can claim financial hardship if they can prove they cannot fiscally manage replacing the foam with eco-alternatives. San Francisco, Washington, D.C., Minneapolis and other cities have already put polystyrene bans in place, and the foam industry is not happy about it. But New Yorkers have proven they are sick of foam to-go cups and clamshell containers blowing around their city and into the Hudson River. The provision includes a grace period that will last until Jan. 1, 2016, after which violators may be subject to fines. 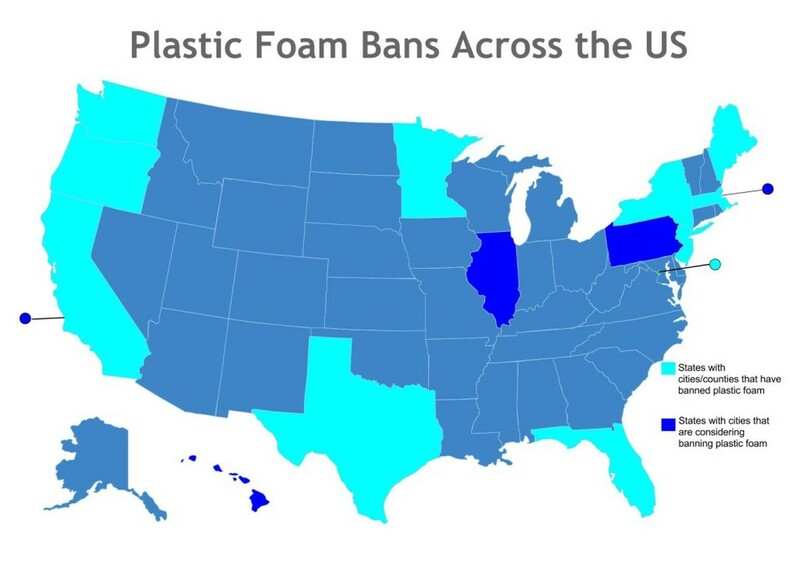 Foam Ban map, as of June 2015, courtesy of Groundswell.org. Used with permission.